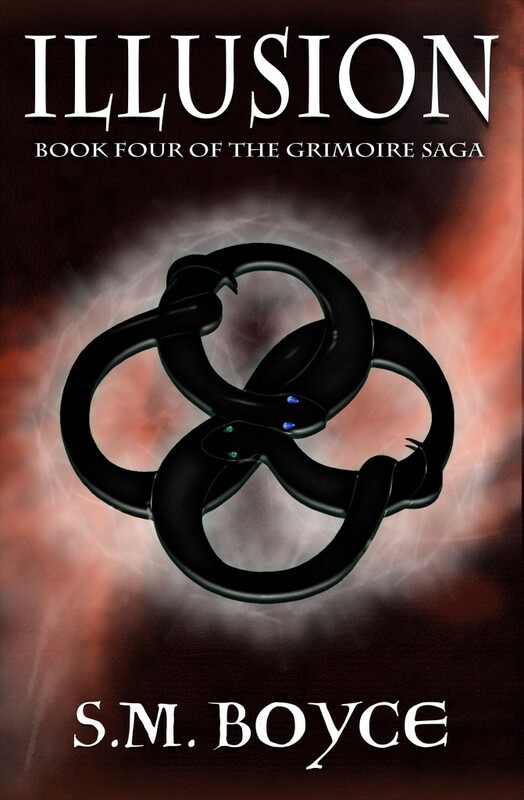 The Grimoire Saga is an Amazon bestselling series by fantasy author S. M. Boyce. Boyce has been designing and outlining this series since 2006, and the final book is nearly here. The cover for Illusion (Grimoire Saga #4) was formally released by Caffeinated Books Publishing. And because I’m awesome, I got you a sneak peek. Gorgeous, right? Want to get an advance review copy (ARC) of Illusion? Sign up for email notifications of when all Boyce's ARCs become available. International Amazon Bestseller. Fantasy Author. Twitter addict. Book Blogger. Geek. Sarcastic. Gooey. Odd. 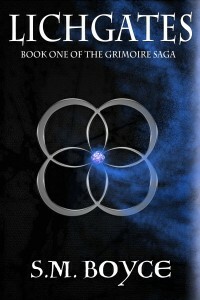 Author of the action-packed Grimoire Saga. S.M. Boyce is a novelist who loves ghosts, magic, and spooky things. She prefers loose-leaf tea, reads far too many books, and is always cold. She’s married to her soul mate and couldn’t be happier. Her B.A. in Creative Writing qualifies her to serve you french fries. Boyce likes to update her blog a few times each week so that you have something to wake you up in the morning. For those of you new to the series, here’s the first book, Lichgates. Make sure you get your free copy (links are below). “The writing is flawless. The kingdoms and surrounding landscapes breathtaking. The Grimoire is a piece of imaginative genius that bedazzles from the moment Kara falls into the land of Ourea. Spring 2013 Rankings #6 Kindle Store | #1 Science Fiction & Fantasy | #1 Epic Fantasy | #1 Sword & Sorcery | #1 Teens Fans of The Hobbit, The Lord of the Rings, and Eragon will enjoy this contemporary remix of the classic epic fantasy genre. Kara Magari is about to discover a beautiful world full of terrifying things—Ourea. Kara, a college student still reeling from her mother’s recent death, has no idea the hidden world of Ourea even exists until a freak storm traps her in a sunken library. With nothing to do, she opens an ancient book of magic called the Grimoire and unwittingly becomes its master, which means Kara now wields the cursed book’s untamed power. Discovered by Ourea's royalty, she becomes an unwilling pawn in a generations-old conflict—a war intensified by her arrival. In this world of chilling creatures and betrayal, Kara shouldn’t trust anyone… but she’s being hunted and can’t survive on her own. She drops her guard when Braeden, a native soldier with a dark secret, vows to keep her safe. And though she doesn’t know it, her growing attraction to him may just be her undoing. For twelve years, Braeden Drakonin has lived a lie. The Grimoire is his one chance at redemption, and it lands in his lap when Kara Magari comes into his life. Though he begins to care for this human girl, there is something he wants more. He wants the Grimoire. Welcome to Ourea, where only the cunning survive. Sweet! Free stuff. I've already downloaded the first book and can't wait to dive into it. Thanks! I hope you enjoy, she is a great author!